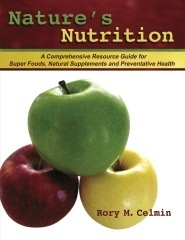 Author and nutritional consultant Rory M. Celmin has just released his first book titled Nature’s Nutrition - A Comprehensive Resource Guide for Super Foods, Natural Supplements & Preventative Health. Nature provides us with an abundance of wholesome nutrition. The choice is ours...the time is now! Author and nutritional consultant Rory M. Celmin has just released his first book titled Nature’s Nutrition - A Comprehensive Resource Guide for Super Foods, Natural Supplements & Preventative Health. Recently published on November 15th 2011, it offers a wide variety of nutritional solutions vital to optimizing health and longevity. Providing the most extensive and revered natural health benefits, Nature’s Nutrition is an essential dietary reference for everyone. Health care costs are going through the roof, and Nature's Nutrition has the answer! Practice preventative health by using wholesome nutrition to help leverage the ever-rising costs of health care. Understanding our body’s unique nutritional requirements and knowing what natural health options are available has never been more important. For example, we all know that apples are good for us. But what if a smoker learns that apples improve lung function because the pectin they contain binds to carcinogens, heavy metals, environmental toxins and preservatives, and eliminates them before they can be absorbed. This is the type of relevant information people need in order to practice preventative health, which will help us better understand our individual nutritional needs. Ever wondered why the people of Okinawa have the longest life expectancy? Nature’s Nutrition highlights the most nutritious super foods, natural supplements, spices and herbs, and reveals their extensive health benefits. It addresses the Glycemic Index, the pH of food, and the truth about tap water as well as the mercury content of fish and the pesticide content found on produce. Discover the most popular food pyramids of the longest-lived cultures, safe options for detoxification and learn how proper nutrition can promote healing. Additionally, this book emphasizes the importance of organic farming for improving soil quality, food safety, and increasing the nutritional content and flavor of foods. Nutrition is the foundation of good health, and the quality of the foods we eat will have a lifelong impact. Nature provides us with an abundance of wholesome nutrition. The choice is ours...the time is now! Certified in sports nutrition from the International Fitness Professionals Association (IFPA), and having received an English Degree from California State University San Marcos (CSUSM), Rory has drawn from over 20 years of research and study to compile this exceptionally informative nutritional reference, and is the first of many books to come. In his spare time he enjoys traveling, tennis, surfing, basketball, hiking and mountain biking, and resides in sunny California.